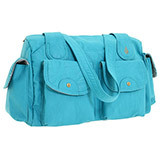 Turquoise is one of the “it” colours this season, so if you fancy a turquoise handbag, stock up in the next six months. But turquoise is not the only option in blue handbags. Think cobalt, teal, ink blue and royal blue as well. Dark blue bags look great with jeans because they pick up the colour of denim. Bright turquoise bags look fabulous with white, apple green, yellow, rich purple, coral and tomato red. Teal bags look amazing with muted reds, chartreuse, dark purple and earth tones. I have a three year old, dark cobalt blue patent snake skin handbag which I like to wear with black, white and turquoise ensembles. But really, as long as I wear dark blue jeans or a denim jacket, my blue bag works with the outfit. It took me a little while to get used to pairing a dark blue bag with outfits, but as soon as I got my head around it I was smitten with the look. In many instances, my dark blue handbag has become my “black” bag. The addition of a new handbag makes existing outfits look and feel new. The power of accessories knows no bounds. So who’s liking the idea of a blue hued handbag? I’m not sure I’m there with the blue bag. I’m still pretty smitten with the idea of yellow for a bag. I love the idea of blue bags, especially as I have too many black coats and jackets. In a recent forum discussion of what constitutes a “modern” bag, I thought one like the first bag in the top row might be guilty of looking matronly (although the color may save it from that fate!). I have a turquoise bag from last year much like that one. Will it date me to carry that style, I wonder? I really, really want a blue and this post has done nothing to tame my appetite. I have seen a lovely cobalt slouchy bag with an apple green stripe which I’m desperate to add to my wardrobe. I love the idea of a blue bag! I already have a teal patent one,but it is more of a green than blue and it goes well with my autumn/winter wardrobe. For summer, I would love a turquoise leather one like the MJ one pictured, but I do not think I can get it now. Maybe next year. This post is so timely since I´ve been looking for a blue bag for a while now. The Steve Madden rose bag is made for me!! I´m a bit reluctant yet, because I wear a lot of black (shoes, jackets). Can you wear a blue bag with jeans and black shoes or do I have to invest in blue shoes, too? I have a cobalt crossbody which turned out to be a lot more versatile than I expected and a blue patent clutch. So I don’t think I’ll be buying more at the moment, but the middle bag in the bottom row looks lovely. I also really like the color and texture of your bag, Angie, and it does function like a neutral. 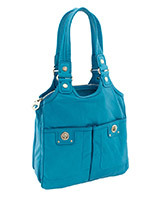 Target’s Hollywood Intuition line has a pretty turquoise blue handbag that I spotted on a recent trip. We’ll see, I might come around to this color when the weather heats up! I have a pool blue leather tote that I wear out in the summer! When I got it originally (6 or 7 years ago!) I bought it for the price ($35.00) and the shape but wasn’t sure I would use it all that much. It is one of those colors that looks like it wouldn’t go with anything and in reality goes with everything! 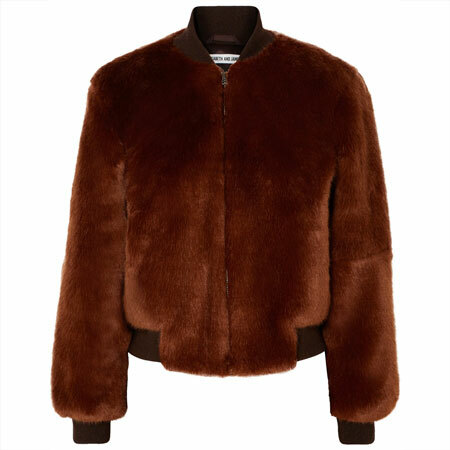 Brown, yes, Red, yes, Black, yes, Navy, yes, you get the idea! Love, Love, Love that bag and I get compliments every time I use it. I figure on a cost per wear basis it is now actually paying me back! I’ve got my turquoise bag in hand and I’m ready for summer! I wore it last weekend with black and white–was a great transition element from winter to spring. LOVE! Brighton has 2 fab turquoise bags. One straw and one patent….very tempting. I need to replace my red bag, but I have wanted a turquoise cross body for ages! It’s going to be a tougher choice than ever. Given how picky I am about cost and material (vegan only please), I guess it depends which one I find and fall for first. All of the above bags are delicious though. Love the Diesel. There needs to be a cheap vegan copy of that. Joy, I don’t think the first handbag looks matronly. Otherwise I wouldn’t have posted it I can see you with an ink blue bag. Julie, the bag you’ve described sounds delicious, and I’ll take one too please. Phoebe, I carry a dark blue bag when I wear black. In fact, I LOVE that combination – black everything with pearls and a dark blue handbag. So modern and harmoniously un-matchy. Carrying a blue bag with jeans and black shoes totally works in my book. 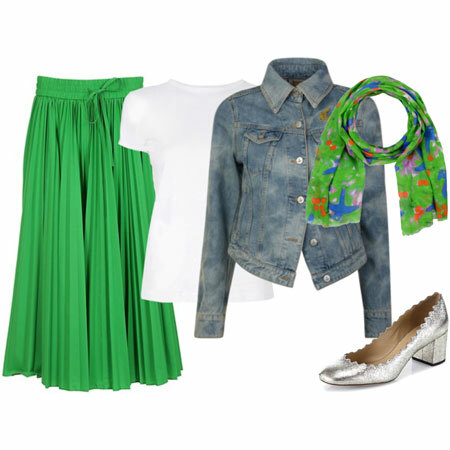 I adore un-matched style that works together. Marianne, you rock that cobalt blue handbag. So glad you got it last year. 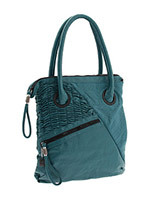 Oh what a temptress you area… I LOVE the idea of a turquoise bag and have been looking around a little bit already. I’m sure I’ll get one as long as I find a reasonably priced one. Love the Marc by Marc Jacobs one above (in bottom row at left) but that’s out of my league! I’m kicking myself right now! I had a beautiful turquoise handbag that I paid a pretty penny for years ago and I just sold it… oh well. I’m really drawn to the Bagtique blue color above. Maybe I’ll be able to swing it once I get that job. I’ve seen LOTS of blue bags here in Switzerland…so strange since a lot of Swiss people tell me that Switzerland is 10 years behind the USA in everything…..NOT in fashion tho! I had been somewhat fixated on turquoise and your post helped me realize that other blue colors are also hot right now. I have a gorgeous Marc Jacobs dark teal bag I got on super sale several years ago. Time to pull it out and wear it in similar ways to when you wear your bag! Thanks! I just bought a gorgeous blue Kate Spade bag that I will start carrying today. I too am smitten with yellow and want one of those, too. I love the third bag on the top row! I agree with blue bags being versatile with jeans outfits. I have two blue bags in rotation and have had a teal one that I wore to death until last year. I have bags in many (too many?!?) different colors so if I rank them blue comes third or fourth after yellow, red and green. Black and white are always in for me I think so I didn’t even put them in the list. I like these bags very much, but like many others, I have a couple of turquois bags already. Is turquois now a “dated” color, I wonder, or is it close enough to these colors to work for spring? I love the dark blue bag. I like turquoise but have never worn it. I appreciate it on other people. I have a blue bag by LAMB which is neither turquoise nor dark blue. It may be pool blue as described above. It’s an interesting color, I hope it goes with everything. This is interesting. I’ll have to look up some images of people carrying different shades of blue bags as I’m having trouble picturing it (a common problem for me, that’s why I love this site!). I am all over the idea of a teal bag. I love teal and it works really well with a lot of the colours I like to wear. I really, really hope I can find a good summer bag this year- real leather, not too pricey but “expensive” looking. No silver hardware. It’s so difficult! Love the look of the turquoise bag! Thank goodness I kept the two I bought several seasons ago – Michael Kors and Kate Spade. 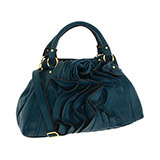 I was wavering on whether or not to pick up an Elie Tahari teal hobo bag I’d been wanting as a birthday gift to myself. Then I clicked on your post and right back over to hit “purchase.” I also really like the dark blue Bagtique one above. I may have to splurge again next month on that one. I have a turquoise colored coach shopper that i used a lot last summer. I liked how it looked with my mainly black and white outfits. My husband is an old car guy and he always noticed that bag (and he never notices anything!) because it remidned him of 1950s car seat upholstery. I stopped carrying the bag because I found the closure annoying and difficult to deal with, but I wish I could find a bag I really LOVE in the same color. I did not find that I needed to wear any blue at all to make the bag work with my outfits. The only colors I didn’t like it with were reds and pinks, but those are not go-to colors for me anyway. I have a turquoisey-aquaish hobo bag from 2 years ago that I was contemplating selling awhile back. Good thing I kept it; it will be perfect for this spring and summer! I love blue! I have a dark blue patent-leather purse which is gorgeous, but large. I haven’t used it yet. I guess now is the time! I really like the idea of a blue bag. All these blues look very refreshing. Angie, thank so much for this tip about combining a blue bag with black and with denim. Some time ago I passed on a lovely blue bag because I assumed it wouldn’t go with denim. Now I know better, hee! But I’m still in love with yellow and red bags! I have one of each and I adore them! I love it!! I’ve been really getting into wearing more grays and blacks, and I think a blue handbag would be a cool accessory to add to the mix. 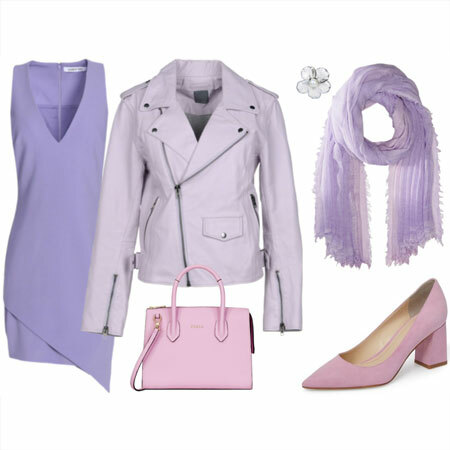 I do have a lot of purple…what do you think about wearing a blue handbag with purple? “Harmoniously un-matchy” Angie, you’re putting it beautifully! That is exactly what I would like to achieve with my style. I think I’ll have to write that phrase on my mirror. I would love a stylish teal or turquoise bag but will be stuck with another two years of carrying a huge and practical diaper bag. 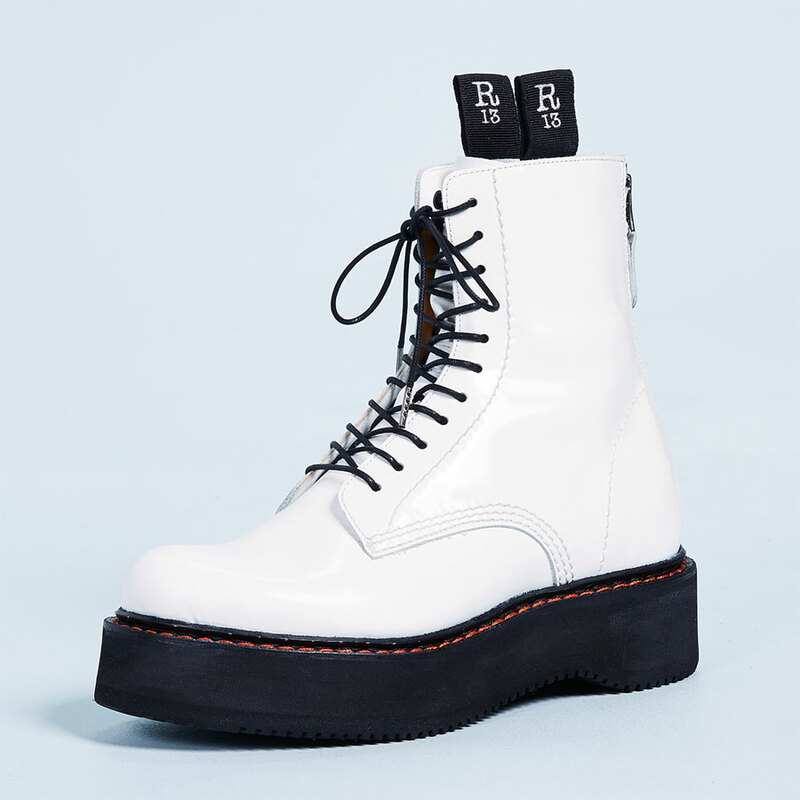 So I might be opting for a pair of shoes in a great shade of blue. Mmmm gorgeous colours. This winter I’d like to invest in a fab coloured bag. This could be an option. 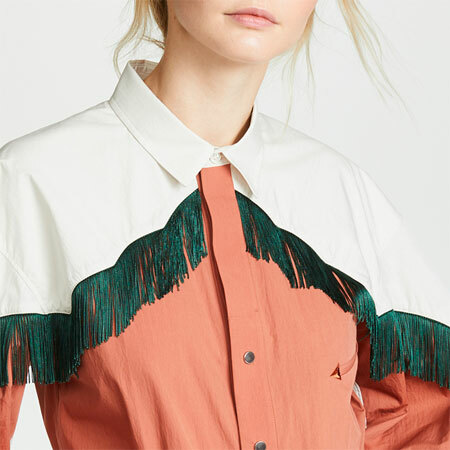 I think I’m going to need ylf help on this one as I struggle to find bags casual enough for my style! I’m completely loving it. 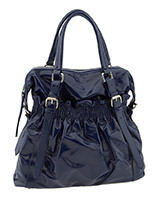 I saved up my money (for months) and bought this gorgeous bag (with a coupon code) from Cole Haan and I love it. Not only is the blue color beautiful, it’s a great travel bag. It fits a 300+ page hardcover and my quart-sized bag for the plane. I just found a darling turquoise blue purse…but it’s Oct!! Can’t decide if I shld wait until spring to use it, or if it’s okay for fall and winter mos. Help!